As a business, Videonations strives to benefit the environment as far as possible and is committed to reducing its operational impact. Videonations makes every effort to comply with, and where possible, exceed applicable legal and other requirements relating to the environment. Please refer to our independent accreditations page. Where practicable, Videonations purchases goods that meet minimum environmental standards and have a minimal impact on the environment. Wherever possible, recycled products are used. Our key suppliers are also committed to reducing damage to the environment with the majority of them choosing to use recycled, chlorine free packaging which cause minimal detriment to the environment. Most of the goods supplied to Videonations are provided in recycled cartons. This packaging is then recycled, along with our waste paper in order that it provides minimal impact to the environment. 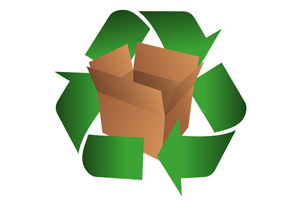 All toner and ink cartridges are purchased as recycled units and are recycled after their use. Where possible, Videonations will recycle goods at the end of their life and where not possible, we will ensure disposal in an environmentally sound manner. All packaging received by Videonations from suppliers is reused. 90% of all products sold by Videonations are delivered to the customer in either the supplier’s original packaging, or re-purposed packaging from other suppliers. Very little packaging is wasted – if it is not fit to be used for another purpose, it is recycled. Videonations actively promotes improved energy and fuel efficiency within the business. PC equipment is switched off when not in use, air conditioning is programmed to operate during office hours only and lights are auto-sensing and switch themselves off when everyone leaves the room. Videonations used the ‘WaterMiser’ system to minimise water waste. By the very nature of our business, Videonations encourages organisations to travel less and conduct face-to-face meetings by video conference. Not only does this save companies costs on potential accommodation fees or train fare, it also helps to reduce gallons of fuel and its associated carbon emissions. The use of public transport is endorsed when members of Videonations staff have to travel due to the nature of their work. Under the UK Waste Electrical and Electronic Equipment (WEEE) Regulations, any electrical and electronics equipment purchased after August 2005 must be decommissioned and recycled in a safe and environmentally safe manner through a certified channel. For customers looking to replace existing video conferencing, audio visual and VoIP equipment, Videonations will ensure any such product is disposed of according to the directive.